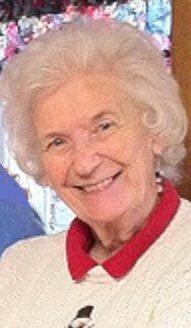 Annette Olt "Mickey" Slasman, 89, a passionate gardener, an avid reader, and a devoted wife, mother, grandmother and great-grandmother, passed away on Wednesday, March 6, 2019 in Fredericksburg. Mickey was born in Baltimore, Md. and grew up in a loving home that embraced the values of service to community and country. She was the daughter of the late Leonard F. and Margaret A. Olt. During WWII, Mickey worked closely with her mother, who directed the Baltimore chapter of the United Seamen's Service Club, a USO-type center that supported merchant seamen. They offered meals, recreational programs, and comfort to sailors and military families. This experience instilled in Mickey a sense of responsibility to give back and to help others, values she would carry throughout her life. Mickey went to The Bryn Mawr School in Baltimore, Md. and graduated in 1947. She then attended Washington College in Chestertown, Md. where she was a member of Zeta Tau Alpha. Mickey graduated in 1951. That same year, at a neighborhood party she met an outgoing handsome medical school student named William Howry "Bill" Slasman. Mickey and Bill were were married in 1953. The couple lived in Baltimore while Bill completed his medical residency, during his training in otolaryngology and throughout his early years of practice. During this time, they welcomed three daughters. Mickey and her family moved to Hagerstown, Md. in 1965 where Mickey became involved in a range of activities, but her greatest joy was gardening. She was a member of the Antietam Garden Club and the Federated Garden Clubs of Maryland, serving as district director. Mickey trained in flower design and landscape design and became a flower show judge and a certified Master Gardener. For decades, she traveled throughout the Mid-Atlantic area giving presentations about flower design and horticulture. Mickey was a highly regarded flower show judge, critiquing designs at some of the most prestigious regional events. Daffodils were her particular passion, and she grew more than 100 varieties in her home gardens. Mickey was a member of the Daffodil Society, an American Daffodil Society judge, and an instructor at the Daffodil Judging School. Mickey was a generous supporter and lover of the arts. During her 51 years in Hagerstown she volunteered at the Washington County Museum of Fine Arts, served as a docent at the historic Hager House, and was a patron of the Maryland Symphony Orchestra. More recently, she was a supporter of and a regular attendee at the Riverside Center for the Performing Arts in Fredericksburg. Mickey moved to The Crossings in Fredericksburg in 2016, where she continued pursuing her many hobbies, including reading, bridge, and all kinds of word games. She also loved to travel, and last April checked off the last item on her bucket list when she journeyed through the Panama Canal. During her years in Hagerstown, she was a member of St. John's Evangelical Lutheran Church. When she moved to Virginia in 2016, she attended The Presbyterian Church of Fredericksburg, officially joining that congregation in February. Ever-positive and remarkably resourceful, Mickey drew her greatest joy from family and her many close friends. She savored everything about life, from a good Sue Grafton mystery to a sunny field of wildflowers to a full-bodied Merlot. She shared her enthusiasm, her easy laughter, and her indomitable spirit with all those she touched. Survivors include her three daughters, Dorothy Slasman Mondak and her husband, Michael, Peggy Slasman, and her husband, Gerry Sarnie, and Laurie Slasman Long and her husband, John D.; six grandchildren Jessica Slasman Long, Victoria Slasman Long, William Slasman Sarnie, Laura Slasman Sarnie, Andrew Mondak, and Daniel Mondak; and two great-grandchildren. She was preceded in death by her husband of 56 years, William Howry Slasman, M.D. who passed away in 2009, her infant granddaughter Annette Mary Long, and two brothers, Warren E. Olt and Robert L. Olt. A memorial service will be held at 1 p.m. on Monday, March 11 at The Presbyterian Church of Fredericksburg, 810 Princess Anne St. The family will receive friends one hour prior to the service in the church parlor. Memorial contributions in her name may be made to the Washington County Museum of Fine Arts in Hagerstown at www.wcmfa.org/donate, The Presbyterian Church of Fredericksburg, or the Massachusetts General Hospital Cancer Center at https://giving.massgeneral.org/cancer/donate/. Online guest book at covenantfuneralservice.com.